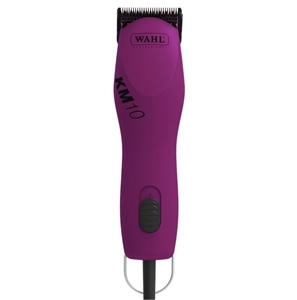 The Wahl® KM10® Professional 2-Speed Clipper features the revolutionary performance of a brushless motor that includes an extended motor life of more than 10,000 hours, providing the maximum in power and torque with the utmost dependability a professional clipper can deliver. This unit offers a smooth cutting ability at (3,000 or 3,700 SPM) that surpasses professional requirements. Clipper made in Hungary, blade made in USA. Maximum cutting power through power transfer and reduced heat development, thanks to new brushless motor technology. Conspicuously longer service life and peak endurance values of over 10,000 hours! Two powerful velocity levels of 3000 and 3700 RPM developed for time-saving cutting and shearing of sensitive areas. 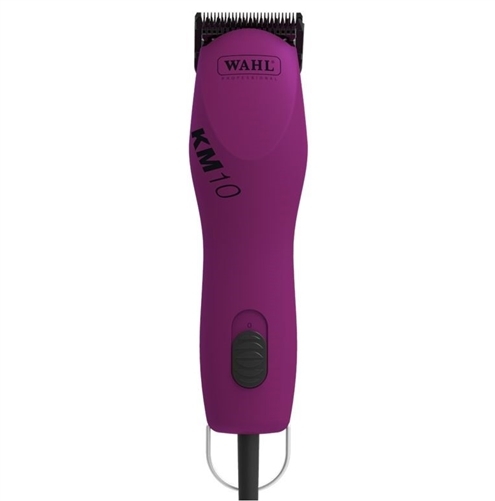 The rounded casing facilitates an optimum hair flow and enhanced cutting speed. Minimum exertion and low joint stress. Confirmed by experts in ergonomics. Impresses through palpably light weight, slim styling and excellent weight distribution. Molds to suit the user‘s hand, with slip-resistant coating for a secure hold and improved handling. Perceptibly quiet, with smooth running characteristics adapted to suit the professional requirements of discerning animal stylists. Uniform cutting performance in all cases, thanks to speed control. Light, ultra-flexible mains cable, 4.2 m long for a greater radius of action. Particularly tough and flexible - verified through flexibility test. Robust metal suspension ring for space-saving storage. Energy-saving switched-mode power supply with low voltage. Greater safety for both user and animal!